New Winter 2018: Here's the perfect gift for your child, grandchild or friends when a beloved little gal is part of the family for her first holiday season. The baby's first baby bear loving heart for girl personalized Christmas ornament stars a cuddly cute bruin clinging to a heart that reads "Baby's 1st Christmas" and is decked with a sprig of glittery holly. These are baby girl ornaments personalized by Russell Rhodes artists, so we'll include the information you supply by painting it where shown using a lovely font. Celebrate this first season with a wonderful memento, the heart and bear first Christmas ornament personalized for a girl. 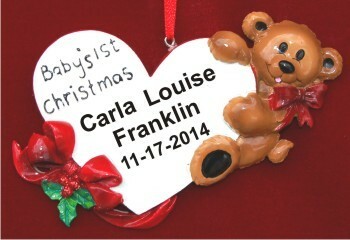 Note: This ornament comes to us already imprinted with "Baby's 1st Christmas" as shown. 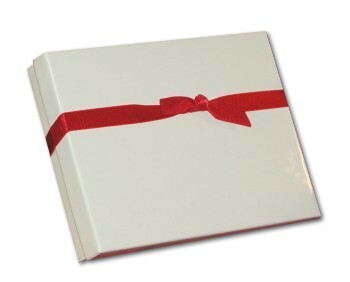 You can additionally personalize on up to 3 lines.